2015 Project Team of the Year! 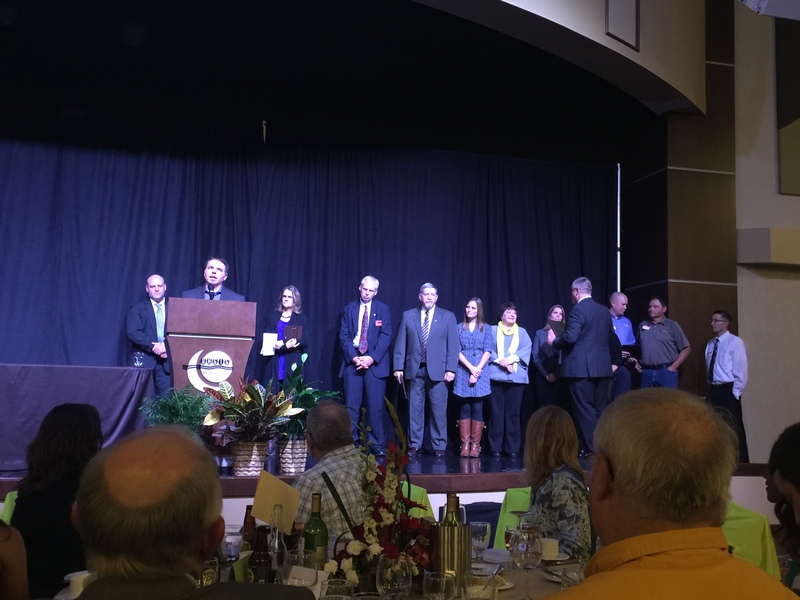 Last Night Sapp Design Associates was honored and humbled to win the 2015 Project Team of the Year Award given by the Springfield Contractors Association. The Project Team of the Year Award is given to the most notable project of the year judged on the creativity, uniqueness, and complexity along with the cooperative efforts of the design and construction teams to solve problems throughout the duration of the project and over all contribution to the community. Southwest Springfield is continuing to grow, and the demand on the public school system is straining the capacity of existing facilities. As a part of the 2013 bond issue, Springfield Public Schools decided to build a new elementary school to replace the small, overcrowded, out-of-date, and aging Sherwood Elementary school. The new building increases the student capacity from around 260 to over 500 kids. This allowed some redistricting to reduce overcrowding in other elementary schools in the area. In addition to the contribution to the school system itself, Springfield Public Schools partnered with the Boys and Girls Club to establish a first-in-the-state relationship. The Boys and Girls Club has 5500 square feet of dedicated space, and shares other spaces, such as the gym, art studio, music studio, media center, and cafeteria with the school. The new Sertoma Unit of the Boys and Girls Club is providing before and after school programs for up to 250 kids, as well as summer programs for the surrounding community. There are only a handful of public school/Boys & Girls Club partnerships across the entire United States. This partnership was made possible by a community that embraces collaboration and supports the mission of the BOYS & GIRLS CLUBS OF SPRINGFIELD.